Ready for an explosive mix of Colombian flavours? There’s something for everyone on the menu at Maize Blaze. Everything is gluten free – plus, veggies, vegans and meat-lovers are all catered for. The Colombian Marching Box ‘guaranteed to keep you marching all day!’ is something of a signature dish. 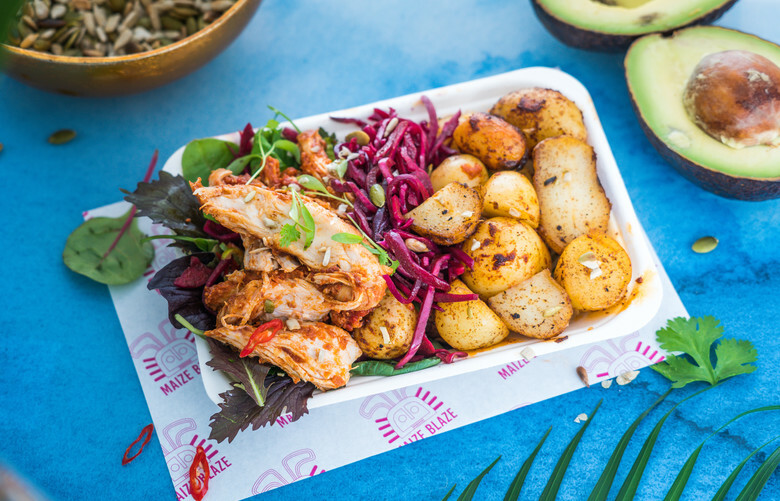 Succulent grilled chicken marinated in their Colombian sauce, with smoked paprika chorizo, sautéed mini potatoes, sweet fried plantain, garlic rice, slow-cooked mini potatoes, guacamole and balsamic red cabbage on a bed of our mixed leaf salad. YUM. Maize Blaze offers £1 off dishes costing £6 or over when a Camden Card is presented.